Whenever we have to celebrate, we distribute sweet or Jaggery ( Gur) to commence. There are plenty of benefits known for consuming Gur. Jaggery gets prepared by boiling the sugarcane juice till it solidifies and then put into blocks. Important: It is, however, suggested to have jaggery in moderation, as it is slightly higher in calories, containing up to 4 kcal/gram. But Gur has high-calorie count. So diabetics and those on a specific diet must consult the family physician before consuming it. One should have after each meal 20 gms of Jaggery (gur). It should be taken as it is known as Nectar or “Amrit” since ancient times. The sugar, on the other hand, is well known as the white poison. With Jaggery the digestion improves whereas the sugar generates an acid that is harmful to the health. In the research carried out in Ayurved, it is known that five times more energy gets consumed for the sugar than the same amount of Jaggery ( Gur) for digestion. The benefits of having Jaggery (gur) are unknown to 99 % of the general public that is why an effort is made to inform them through this write-up. To put it in a nutshell Jaggery (gur) contains many vitamins and minerals, it enhances and improves the immunity. In winters, it keeps the body warm while keeping one safe from cold and cough; It is passed down from ancient times to the human race. The jaggery assists in the working of the body’s systems. All these systems have their specific organs to work. One should know that all these systems are related to each other. The muscular system needs to be strong through the absorption of calcium which is found in Gur to give movements to the bones and muscles. The muscles get controlled by the nervous system. Some of the muscles are automated like heart, muscles in the stomach but may get moved by conscious control. Digestive system, Taking jaggery ensures that no gas generates in the human system. The optimal juices secrete and ensure that no stomach gas bothers you. That, in turn, provides stimulated bowels movement and therefore makes sure that one has no problem in passing the bowels and are not hard. Jaggery acts as the diuretics ensuring good health. Right after meals, one likes to have some sweet; the best item is jaggery. One can live healthily by having Jaggery that ensures no constipation. The digestive system → ensures the breakdown of the food into smaller portions and retrieves nutrients from it. The food we eat provides fuel. Nutrients in food give the cells of the body the energy they need to function. The food is broken down into minuscule pieces so it can be absorbed and used by the body. It is known proteins that need to be broken down into fatty acids, glycol, starches and amino acids. The whole process of digestion is assisted by chemical and nervous system coordination. Circulatory system: This is the most prominent system as the blood is engaged in transporting oxygen. Wherever oxygenated blood travels, it gives nutrients, oxygen and carries the carbon dioxide and the wastes to different parts of the body. The function of the blood is essential to keep life going. The circulatory system is highly crucial in continuing growth. Its proper working is responsible for the transport of oxygen and nutrients to all cells, as well as getting rid of unwanted carbon dioxide, waste products, maintenance of minimum pH, and the mobility of the elements, proteins and cells, of the lymphatic system. The healthy heart pumps the blood throughout the body, i.e. from head to toe. Veins(except pulmonary veins) get the poor oxygen blood from all organs and give it to the heart. The heart pumps that blood. Then arteries (except pulmonary arteries) arrange the oxygenated blood to various vital parts of the body. So it means that blood travels from different chambers of the heart all the time. Jaggery cleans the body: Jaggery is the leading natural cleaning agent of the body. You are asked to take a little of the jaggery to and see that any harmful substances in the body get removed. For skin, the jaggery removes the toxins, from the body and helps the liver thus removing the load on the liver, i.e., it removes the toxins from the body due to this cleansing operation resulting in glowing skin. Jaggery removes the acne problem if any. So better take a bit of Jaggery after each meal and see the wonder that follows. The effect of Jaggery is heat producing, therefore having it comforts in the cold, or with running nose or a cough. In case one does like as the taste of raw jaggery one may have it added in tea or sweetmeat. For Energy: If one gets very tired or feels weak, on consuming jaggery, the energy level increases pretty fast, and Jaggery gets digested pretty soon. The sugar level does not rise on having jaggery. After having a busy and tiring day, have jaggery for a quick recovery. Boosts immunity: Jaggery has antioxidants and minerals such as zinc and selenium, which in turn assists in venting free-radical damage and also raise resistance against diseases. 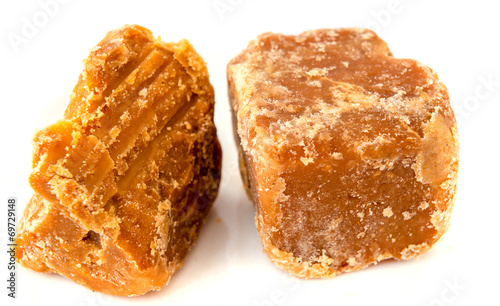 Jaggery also helps to enhance the total count of haemoglobin in the blood. Reduces menstrual pain: Jaggery has plentiful of richness in many required nutrients. It is an effective organic treatment for women’s menstrual problems, especially giving relief from cramps. In case you experience a mood up and down just before your monthly period, you should consume a small piece of jaggery daily to combat symptoms of PMS. It leads to the giving of endorphins. These endorphins ease the body, thereby preventing premenstrual syndrome (PMS). Consume a small piece of jaggery daily to combat symptoms of PMS. Gur is essential for the women; they should have jaggery for the non-troubled menstrual benefits because it has plenty of essential nutrients, and leaves no room for a proper and sure way to get rid of menstrual difficulties faced by half of the human the population (i.e., women) of the world. A big a feeling of reassurance and relaxation following release from anxiety or distress from the cramps. Jaggery is one of the primary sources of Iron; especially it is highly beneficial for anaemic people. Gur is healthy for women as it comforts them in their confinement either during pregnancy or monthly periods. The phosphorus found in gur in good quantity strengthen the bones. Whereas in the sugar this does not happen. Prevents anaemia: Gur is rich in iron and folate which help prevent anaemia by ensuring that a sufficient level of red blood cells is kept. It is especially beneficial for pregnant women. It ensures that a reasonable level of red blood cells remains. Moreover, it makes available instant energy to the body. Boosts intestinal health: Jaggery also raises abdominal vitality due to its good magnesium content. With each 10 gram of jaggery, you get 16 mg of magnesium, which is 4 per cent of the daily need of this vital mineral. Cools the stomach: Jaggery helps in maintaining an average body temperature that in turn helps in keeping your stomach relaxed. Physicians recommend drinking Gur Sharbat (jaggery soaked in cold water) throughout the summer months to cool off. Controls blood pressure: Jaggery has potassium and sodium, which play an essential role in the maintenance of acid levels in the body. It makes sure that an average level of blood pressure is adequately maintained. Prevents Breathing problems: By consuming jaggery regularly, you can avoid many respiratory issues namely breathing difficulty such as asthma, bronchitis, etc. Physicians recommend eating this natural sweetener with sesame seeds for astonishing benefits for the respiratory system. Relieves joint pain: If one gets aches and pains in your joints, eating jaggery can provide you with much-needed relief”,You can consume it with an inch of ginger to get rid of joint pain, or even drink a 250 mls of milk with gur each day to help energise the bones, thus stopping joint and bone problems such as arthritis. Weight loss: Jaggery is quite as useful as an aid for weight control. It is because jaggery is a rich source of potassium, which is a substance that helps in balancing of electrolytes as well as making muscles and strengthening metabolism. Potassium helps in the reduction of water retention, that helps in managing your weight”, says Delhi-based Nutritionist Anshul Jaibharat. These factors play an essential role in required weight loss, so if you want to get rid of some unwanted pounds, include this food in your diet. Excellent source of energy: While sugar is a simple carbohydrate that gets absorbed in the bloodstream instantly and gives instant power, jaggery is a complex carbohydrate that provides strength to the body slowly but surely and for a much longer time. It means that the amount of diabetes does not get raised immediately. Additionally, Gur prevents fatigue and weakness of the body.